FLAT FLOTUS has got a new cardboard cutout made of herself eating, in order to help the mainstream media to raise awareness about her food choices. With this useful journalistic tool, news photographers can now stage any number of friendly, endearing, and highly educational photo ops to illustrate the First Lady's healthy dieting - without ever meeting her or even having to leave the studio! Michelle Obama pays a visit to the Monument Valley in Arizona. 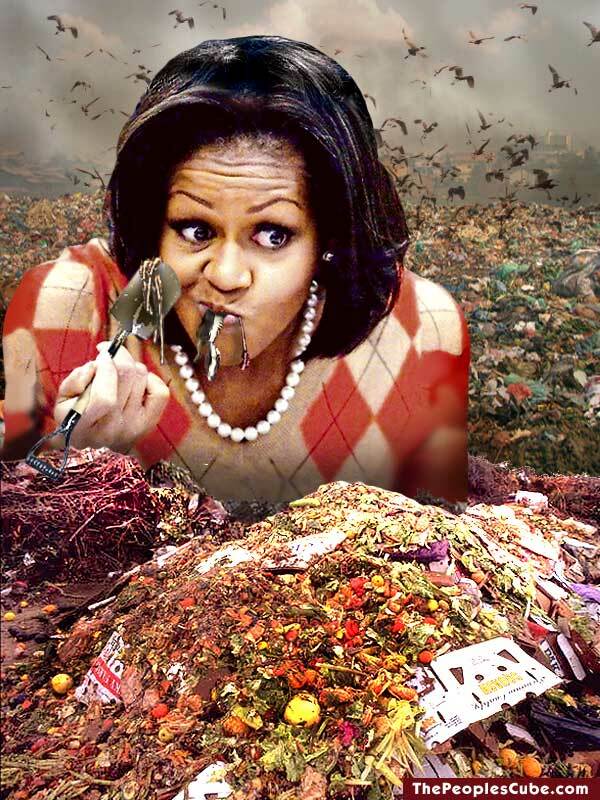 Michelle Obama tours Fresh Kills Landfill in Staten Island, NY. And, finally, here's the cutout itself, on a PNG file with a transparent background. Your move, comrades! Nothing beats the Party's favorite delicacy. Bon appetite! Nice one! In the meantime, FLOTUS has been focusing on the little guy - just like her husband before her. Thank goodness Gaia that everyone can finally acquire a full life-sized cardboard image of Dear FLOTUS! Our Collective has been begging for hours days weeks months years for these Graphic Reminders Of Our Place In The World Of Next Tuesday. Of course, one will be placed in the shrine meeting room dedicated to Dear Leader. Naturally, one will be placed in every school room so that the children can march by every morning and kiss salute The Guardian Of Their Health. IN THE NAME OF THE HOLY MARX!!!! 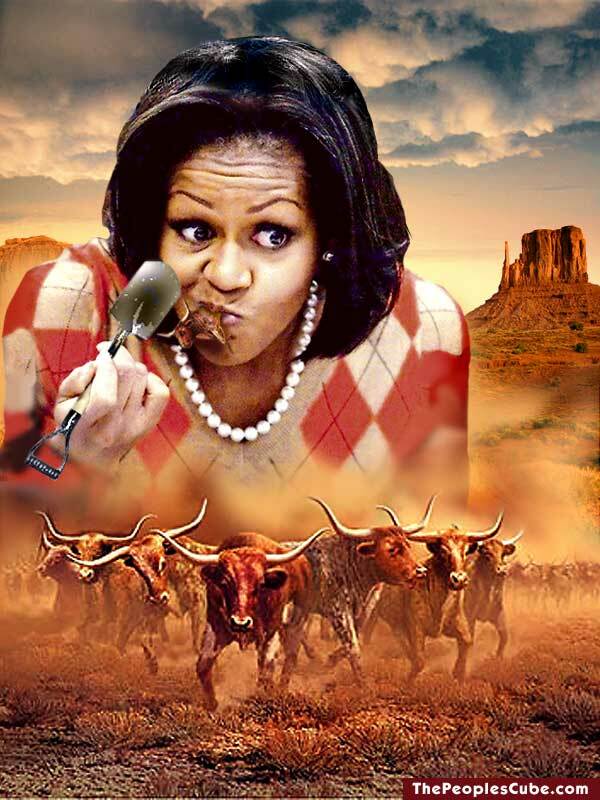 How many cattle have to be slaughtered to feed her??? Real picture or photo chop? What right wing thug makes " her daintiness" appear to be in need of a shave? Somebody is going to get a good swift kick in the chair sitter for this one! 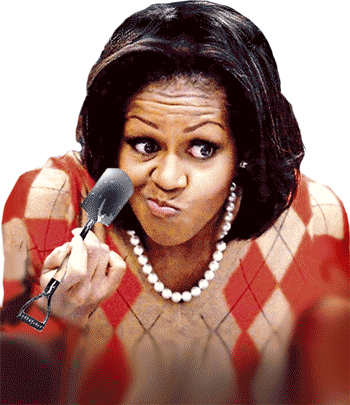 First, Michael Jackson turned from a poor black boy into a rich white woman, now Michelle Obama is turning from an angry black woman into an angrier white man - she will probably start wearing a glove on the white hand first, but soon, all will see. Heh! heh!, you got spell checker? Did you mean FLOTUS or FLATULENCE? ..Remember, I am His Excellency President for Life, Field Marshall Al Hadji Doctor Idi Amin Dada, VC [‘Victorious Cross’], DSO, MC, Lord of All the Beasts of the Earth and Fishes of the Sea and Conqueror of the British Empire in Africa in General and Uganda in Particular, and Professor of Geography. 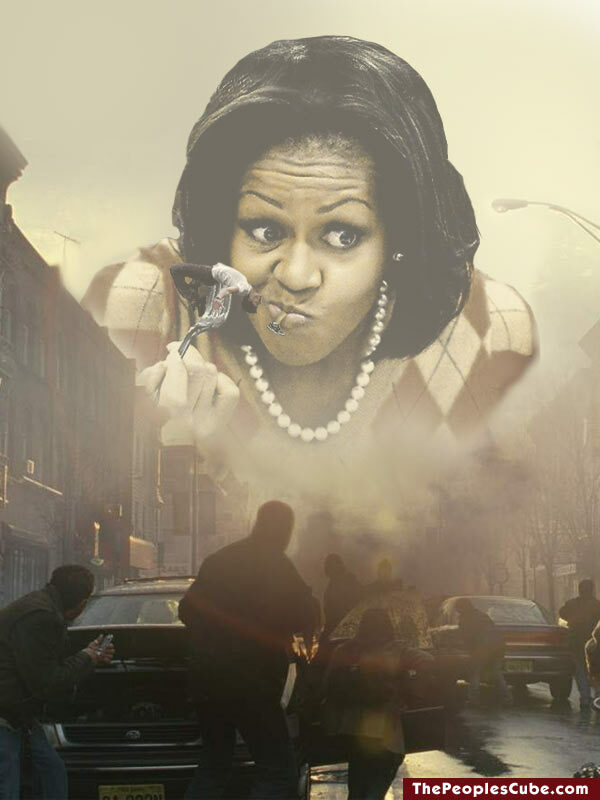 FLATUS, my dear dictator: First Lady Above The United States. FLAT POTUS Drunken Barack: Add Your Message!